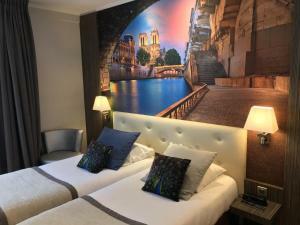 Located 1.4 km from Porte de Versailles Exhibition centre, opposite Georges Brassens Park, Hôtel du Home Moderne offers contemporary rooms with free Wi-Fi internet access. The air-conditioned rooms are stylishly decorated in pastel colours and feature a flat-screen TV with satellite channels, telephone and safe. 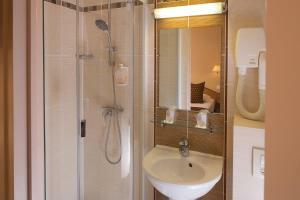 All of the rooms are soundproofed and some of them also have facilities for guests with reduced mobility. Guests can enjoy a buffet breakfast in the hotel’s dining room, or in their guestroom upon request.The reception desk at Hotel du Home Moderne is open 24 hours day and offers a reservation service for excursions. Several buses (line 95 and 80) link directly the hotel to Paris city centre. Convention Metro Station is a 15-minute walk away. 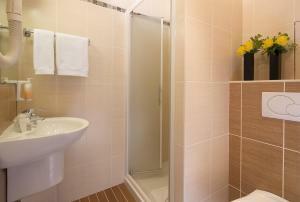 This room offers a flat-screen TV, a desk and a private bathroom with free toiletries. Please note that extra beds cannot be accommodated in this room type. Maximum occupancy is 2 guests. Rate: € 131.83 ... € 260.00; select dates below to get current rates. The spacious suite has a seating area with 2 single sofa beds and a minibar. You can add 2 extra beds to this room. Rate: € 204.93 ... € 211.42; select dates below to get current rates. Rate: € 145.54 ... € 211.64; select dates below to get current rates. 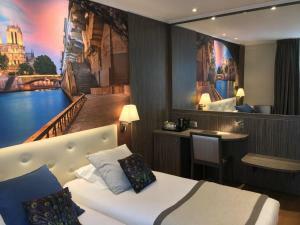 Rate: € 113.00 ... € 275.00; select dates below to get current rates. This triple room features a satellite TV and air conditioning.